One thing that separates a hotel from other types of lodging establishments, such as motels, is that four and five star hotels usually offer room service to their guests. Hotel guests order room service for a variety of different reasons. Some hotel guests may order room service to experience the luxury of being served food within their own room. Other hotel guests order room service because they are tired after sightseeing or traveling and simply want to eat and relax in the privacy of their own room. Sometimes, hotel guests order room service because they have important, private business meetings or other events that prevent them from dining in public. Whatever the reason, hotel guests have very specific expectations of room service. It is important for the hotel kitchen staff to meet and exceed these expectations at all times. Here are five tips for making and delivering room service in a hotel. These tips will ensure that customers are satisfied with their orders, and will also help your hotel kitchen staff be efficient and effective in keeping up with room service orders. First, be sure that the room service menu is short and simple. A long menu, with a wide range of different options may seem like a luxurious offering to hotel guests, but it translates into a whirlwind of problems for the hotel kitchen staff. The more items that are offered on a room service menu, the higher the chances are that a hotel guest will receive the wrong order or an incorrectly made order. A few simple menu items is usually all that is required to have something that everyone will be able to enjoy. Guests who order room service expect to receive their food in a timely fashion. Anything that takes more than thirty minutes to prepare from start to finish should not be included on a room service menu. Ensure that all of the items on the menu can be prepared quickly and simply. 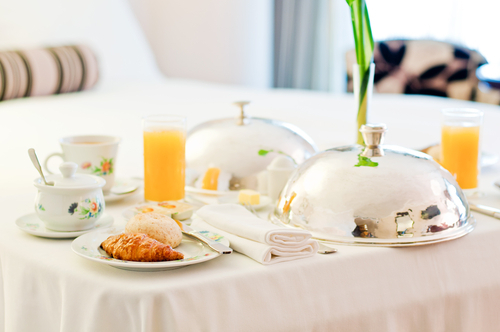 When you receive a room service order, prioritize that order by placing it at the top of your order list. This will guarantee that hotel guests receive their room service order much more quickly than they expected. Depending on the size of your hotel, the ordered food can cool in the time that it takes to transport the room service order from the kitchen to the guest's room. You must use the right equipment to keep food hot during the transit period. Chafing dishes and dinner plate covers are excellent tools. As soon as room service orders are cooked, assembled, and plated, hotel wait staff should immediately deliver the food to the guest's room. Many hotels try to cut down on wait sfaff travel by grouping different floors together. This, however, can cause some guests to wait too long for their food. Deliver room service orders on a room by room basis. Finally, it's important to set specific hours during which your hotel kitchen is open. This may be frustrating for hotel guests, but it is equally frustrating and impractical for a hotel kitchen to operate at all hours of the day and night.